The cycle of poverty is often just that – a cycle. Stillwater CARES, along with countless other social service agencies, are committed to assist individuals and families in breaking that cycle and building resources for a better life. Getting Ahead is a 10-module, 20-week course that equips under-resourced individuals with an understanding of the what they need to lead a stable and self-sufficient life. Working in small groups, participants identify the resources they need most to get ahead. The next Getting Ahead Class will start in February 2018. 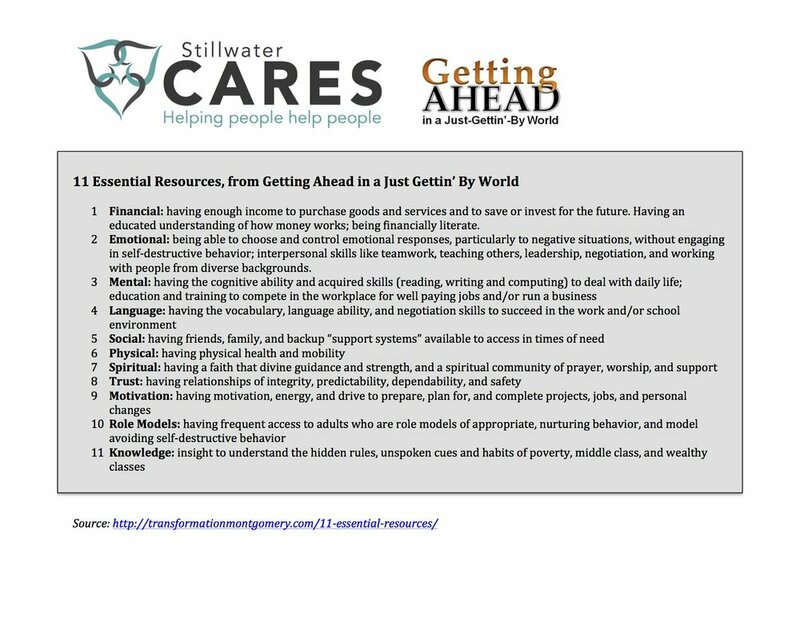 Email connect@stillwatercares.org or click the Getting Ahead Information link below for an application and details about the class. Donations of any size can be designated to help someone Get Ahead. For $50 a month, you can invest in a person’s future story with a full Getting Ahead scholarship. Graduates advance in their goals when a circle of "Allies" are there to encourage their journey forward. Be a part of Getting Ahead graduates’ network as a friend or advocate. For more information email connect@stillwatercares.org. We’re always adding to the Getting Ahead Network! We’d love to put your strengths and talents to work. 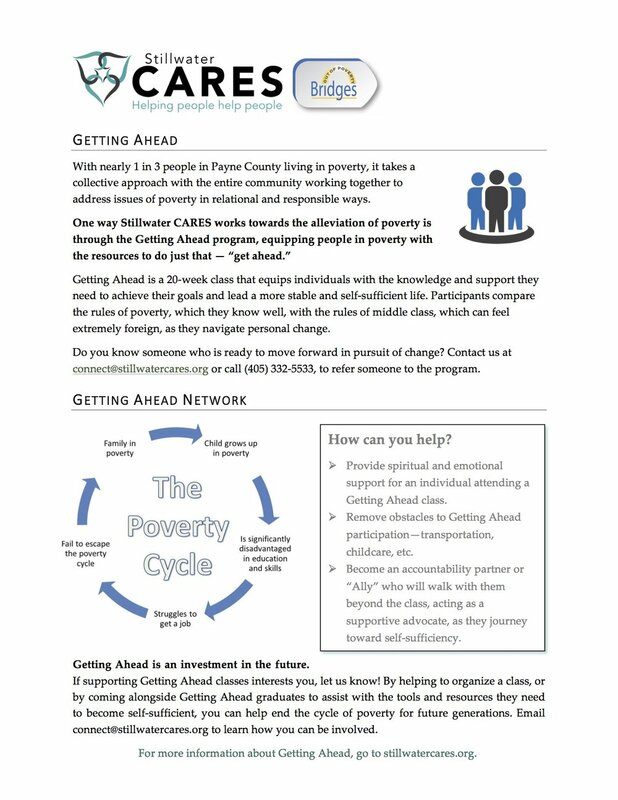 To be a part of the life-changing Getting Ahead program as a facilitator, mentor or other support, or for more information on the next class, email us at connect@stillwatercares.org. Stillwater CARES is also part of a nationwide Getting Ahead Network. Getting Ahead facilitator training and other similar opportunities are available online.